I have not posted any Indian recipes lately. Actually, I have not posted anything lately, since we were away celebrating my son’s first birthday. Along with all these yummy things, I was also introduced to lauki ki sabzi or bottle gourd, which is called calabash in some parts of the world. I don’t know why, but we just never ate it much in South India. Or maybe it was just my family. Anyway. Most people I know detest lauki and consider it a pretty pathetic vegetable- the kind of thing you’d wrinkle your nose at. Not because it smells bad, but because it’s boring. Perhaps the same way people would react to brussel sprouts. I always enjoyed lauki, and in the summer it’s a great vegetable to incorporate into your diet because of it’s cooling effect. I did a mash-up and added lauki to dal (lentils) to make a two-in-one dish. When the oil is hot, add the mustard seeds and let them pop, followed by the cumin seeds. Next, add dry spices, (turmeric powder+coriander powder+red chilli powder+garam masala powder) onion, tomatoes, ginger-garlic paste and stir-fry till the onions are soft. Add in the chopped lauki, and cook for a minute or two. Pressure cook for about 3 whistles or until the lentils are cooked. paste and dry spices, then taking them out, adding the lentils and water, letting the whole thing simmer, and then re-adding the lauki to the pot so it can cook through. (Phew! I just could not fragment that sentence.) Otherwise it will get too mushy. 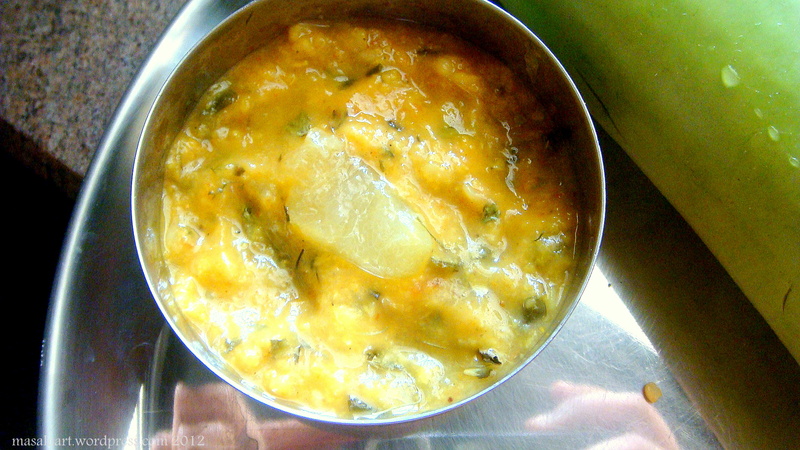 It is not easy to make yellow dal look highly appetizing, but I assure you, this is the ultimate comfort food. For me, rice & dal work like chicken soup when I’m ill. I thought it would be nice to share some everyday fare!! I love how it looks in the photograph. Love Pandara Road and Big Chill. These are my go to places whenever I visit Delhi.